6-9pm Thursday 27th Sept, at the Alex Hotel, Dublin, just around from the Davenport hotel. This is a brand new event. I run a radio show called Inspirational People Inspirational Stories on Dublin City FM. I am also one of Ireland’s top CEO and sports star coaches. I help people become the best they can be. My aim is to share what has worked for me and my clients in the seminar. How to be the ultimate you. How to MAKE it happen in life: M = How to get into the right Mindset Or how to Motivate yourself and others A – what are the Optimum actions to be taken to go from where you are and where you want to get to. K – Knowledge you can learn and how to develop a knowing faith in your own self. E- Energy and how to optimise you energy to optimise your performance in life. How to achieve your business/life goals quicker and easier. How to go from a near death experience and see doctors every week (as I did) to perfect health and never having to go to the doctor). Doug Gordon, Radio show host, Ex Head of Sales, Marketing and PR of Davy, MD and Board Director of Veltrust, CEO of DDG Performance Optimisation. Ex Premier league hockey player. Master teacher of 5 modalities of healing, mindset/performance/meditation coach. Be ready to get involved. Be ready to have a lot of fun! Tickets on sale up till the 27th unless they sell out beforehand. 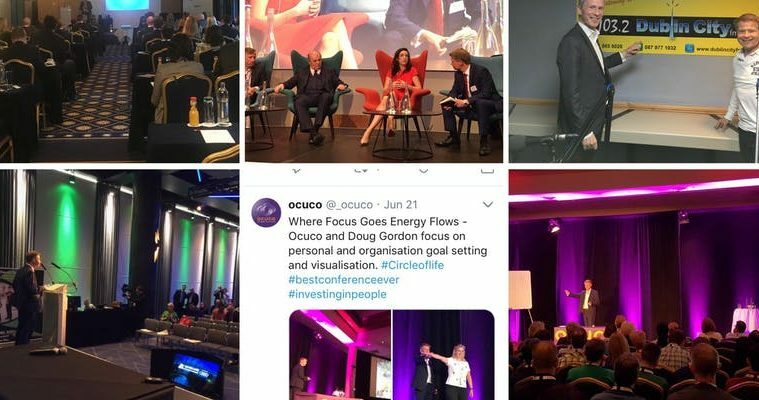 If you look at the Ocuco Ltd Twitter they described my last conference as #bestconferenceever. Next ArticleWhat is Psychographic Segmentation?